Costa Calma Beaches. Fuerteventura Beaches Guide. Beaches in Costa Calma. The best beaches in Costa Calma. 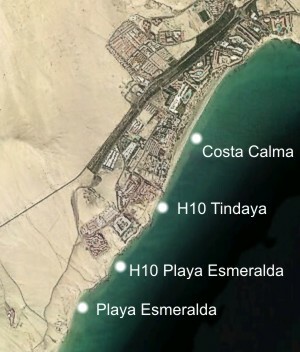 The area of Costa Calma is one of four resorts in Fuerteventura. Throughout its long beach of almost 2 kilometers long, there are a number of Hotels and Serviced Apartments that have been installed in nearly 30 years (the last built were theR2 Pájara Esmeralda Beach and H10). The beach of Costa Calma is formed by a "Beach Home" with a length of 1.5 kilometers. North of this there are two small beaches, protected and family, where there are 2 hotels of the SBH (the most important of Costa Calma), and south, there are 3 beaches, one under the Hotel H10 Playa Esmeralda, the second by the Hotel H10 Playa Esmeralda, and the third and last of this area, called Playa Esmeralda. Among the latter two beaches, we find that for me is one of the best Bars Fuerteventura: The Palmita, not to be missed because you can eat there, rich, inexpensive and in the same sea. At low tide you can walk along the beach, it is a pleasant walk of just over an hour, where we can see the differences between all these beaches. (At high tide, these beaches are separated from each other by the sea and rocks, making it dangerous to attempt to cross from one to another beach). The Costa Calma hotels located on the beach, they're really: you leave the hotel pool in less than a minute and you're on the beach. This area is highly recommended for a good holiday because the weather is almost assured.